We also stock other DIY kits to help you make your own delicious homemade artisan foods, from sourdough and other fermented foods to ginger beer, butter and tasty homemade cheese. Cider Homemade Starter KitThe Mad Millie Cider Kit contains everything you need to make 12 x 750ml bottles of your own refreshingly crisp apple cider at home.It includes natural fruit juice concentrate made from the very best fruit and packed to retain the delicate flavours and aromas and ensure your cider is full of zest.ABV: Approx 5.2%This Kit Contains: - 9 Litre Cider Ingredient Kit (fruit concentrate, sweetener, flavour and yeast) - Hydrometer - 12 Litre Fermenter with Thermometer - Bottle Brush - Carbonation Drops - Syphon with tubing - Mixing Spoon - Sterilisers and Cleaners - ..
Cider Apple Homemade Refill KitCider replacement kits for homemade apple cider.Use with your Cider starter kit and this gives you with everything you need to make your next batch of Apple Cider.ABV: approx 5.2%The kit includes: - 9 Litre Cider Ingredient Kit (fruit concentrate, sweetener, flavour and yeast) - Carbonation Drops - Detergent x 2 - Steriliser x 2.. This is a new Next Batch style kit to follow on after using the Cider Starter Kit. 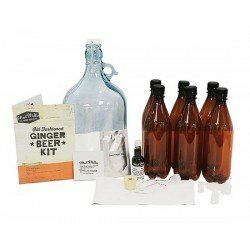 This Next Brew Alcoholic Ginger Beer Kit is a burnished golden pour with a fluffy white head. The biscuit malty character comes through with a sweet and subtle bitterness followed by a kick of fiery ginger.Kit Contains: Gluten Free Malt Extract Blend (gluten free malt extract, natural ginger flavour, hop extract) Dextrose Sweetener Sachet Ale Yeast..
Saccharomyces Cerevisiae – Ideal for full bodied, full flavoured dry and sweet white wines. BV7 will both preserve and enhance the grape variety and terroir, promoting excellent flavour complexity, good wine structure and balance but especially FULL AROMATIC FLAVOUR. BV7 produces a wide range of low level beneficial congeners such as higher alcohols and esters and high glycerol promoting full body and structure to the wine and contributing significantly to mouth-feel, wine texture and palate intensity. Avoid fermenting above 13% abv. ethanol, BV7 is not particularly ethanol tole..
Make ginger beer the traditional way!Make delicious ginger beer from scratch using ginger, brown sugar, fresh lemon juice, ginger beer yeast, water and nothing more. Fresh, no additives, and nothing artificial! It is also gluten free!Makes 6 x 750ml bottles of both alcoholic and *non alcoholic ginger beer. Kit Contains Glass 5 L Fermenting Jar with Airlock Steriliser Straining Cloth Ginger Beer Yeast 3 Way Sugar Measurer Dried Ginger 6 Reusable 750ml PET Bottles Instructions for both Alcoholic and *Non Alcoholic Ginger Beer*Note: Included recipe for Non Alcoholic Ginger Beer may contai..
Saccharomyces Cerevisiae – The ‘only strain’ for Germanic aromatic white wines. AW4 is noted for developing powerfully fragrant, full spice aromatic wines and is a perfect match for Gewurztraminer and also recommended for Sauvignon and Semillon where the Oenologist requires a positive aromatic esters contribution from the yeast. AW4 is a good fermenter across the range 14 to 30°C (57 -86°F), low foam formation and medium to high glycerol. It will ferment up to 14.5% abv. ethanol providing the temperature is held within the 20 - 25°C (68 -77°F) range and the pH is above 3.0.8g pack..
Saccharomyces Cerevisiae – Acid reducing strain excellent for fruity white & blush country wines especially where residual sugars are desired.MA33 has the ability to metabolize between 30 and 35% of malic acid making this strain the perfect choice for country fruits which are naturally high in acid. Reducing malic acid will soften the wine and give a vin nouveau character for early consumption with a balanced palate.MA33 is also noted for its production of fruity esters and fusel oils conferring fresh fruity character to the wine. There is an increased chance of Malolactic fermentat..
Saccharomyces Cerevisiae – Ideally suited for rich, full bodied red wines with exceptional flavour complexity.Noted for exceptional depth and flavour complexity, R56 exhibits complex aromatics during fermentation conferring an old world quality which one might only expect from natural flora multiple strain fermentations. Unusually for complex aromatic strains, R56 still respects the varietal character of the fruit and confers good structure and balance. R56 is also a high glycerol producing strain. 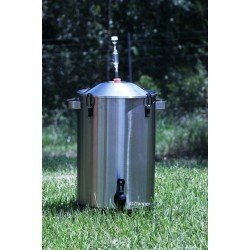 R56 is a medium rate fermenter with optimal temperature between 22 to 30°C (72 -..
Saccharomyces Cerevisiae - Perfect for sweet white/blush and dessert wines from grape and particularly from country fruits & flowers. CY17 produces high levels of desirable congeners during fermentation including aromatic thiols, imparting rich fruity aromatics, full body and ‘tropical’ flavour characteristics to the wine. CY17 is also noted for high glycerol formation further enhancing sweetness. This is a slow fermenter compared to all other strains in the Vintner’s Harvest range typically taking up to 21 days to ferment table wines and up to 35 days for dessert wines. CY17 prefers..
Saccharomyces Bayanus – Very good all round strain, best choice for high alcohol and fortified wines but also excellent for most country wines, sweet sparkling wines and ciders. If you only had one wine yeast strain, this would be the strain because whilst being relatively neutral in character SN9 does introduce excellent weight and structure no matter the must or fruit and produces a congener profile that always compliments the wine. SN9 is particularly good when fermenting flower or low fruit recipes which often lack vinosity, weight and depth. SN9 is another strain noted for i..
Saccharomyces Cerevisiae – Exceptional strain for full fruit varietal and country red wines promoting good structure, balance and colour. The majority of yeast strains strip out fruit flavour and colour from the must, not so with VR21 which is particularly noted for preserving and retaining the natural fruit characteristics of the grape / country fruit and enhancing palate length. VR21 is a relatively neutral strain producing subtle levels of aroma and flavour compounds, allowing full expression of varietal / country characteristics whilst enhancing colour, wine structure and balance.. The Great Ozi Fermenting Kit!Fermenting food is one of the oldest and easiest form of food preservation. Not only that, it is extremely healthy!Our Ozi Fermenting Kit includes the equipment you need to start fermenting!Kit includes:Pickling salts: one bag of 250g of pure salt and one bag of 100g of calcium chloride (can be used in place of salt at a 1% dilution rate or add to salt brine to keep vegetables crisp) 1 x 850ml Tapered Weck Jar with Fermenting lid, seal, clips and dunking weight 1 x 850ml Tapered Weck Jar with Snap on Plastic CapThe jars are high quality German made ..
Ferment with Stainless Steel like the Pros!• 23L capacity fermenter • High grade #304, scratch resistant, stainless steel body • Handles for easy lifting of the fermenter • Seamless inside finish for easy cleaning to prevent contamination • Litre measurement stamped on inside body of fermenter • Includes 22mm rubber bung and airlockMany brewers and fermenters prefer to use glass or stainless steel over plastic. 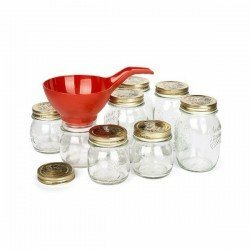 Plastic is more difficult to sterilise and can impart an odour to your ferments. Stainless steel is easy to sterilise and reportedly gives a cleaner taste to beers. Upgrade to the..